In all of the previous posts, I've talked about optimizing ray tracing. I've mentioned path tracing, but never spoke of path tracing specific optimizations. This post will be a small survey of implementations and research about path tracing optimizations. Path tracing is great for simulating global illumination by tracing rays, and of course, these rays have to follow "realistic paths". As observed a long time ago (1760) by Johann Lambert, intensity of light from an ideal diffuse surface is directly proportional to the cosine of the angle $\theta$ between the direction of the incident light and the surface normal. This is called Lambert's cosine law in optics. If you would order them by calculation cost for the path tracing algorithm, the reflection would be the easiest, there is only one solution, one ray to calculate. The glossy one is harder to calculate, since you have to accumulate rays with different weights, but still simpler to fully calculate than the diffuse option. Besides these simple examples, materials can contain many functions to bend incoming rays. The collection of these functions describe the Bidirectional Reflectance Distribution Function (BRDF). Which in turn, you can even extend to allow for rays extending through the surface with a Bidirectional Scattering Distribution Function (BSDF). The intensity of light from an ideal diffuse surface is directly proportional to the cosine of the angle $\theta$ between the direction of the incident light and the surface normal. This leads to an interesting optimization: cosine weighted sampling. Since the incoming and outgoing light is measured by a cosine, the outgoing rays nearly parallel to the surface don't add any (useful) information to the final solution. I could write this whole post about this optimization, but that would be a waste of time, since there are already many good examples out there. This post from Rory Driscoll shows results as well as the maths behind it. As mentioned above, when you've found a ray-triangle collision, the direction of the new ray is usually 'bruteforce' calculated by taking a random direction on the hemisphere. For diffuse surfaces, this is no problem, since every outgoing direction weights the same. If you would apply the same to perfectly reflecting surfaces, chances are you will most likely never find the correct outgoing ray. By knowing the material properties you can determine how to sample the outgoing ray. This sampling strategy can be a very easy optimization if you're willing to end up with an approximation. If you look at the 3 examples from the image above: one variable for the degree of reflectiveness can produce these examples. The problems with this reflectiveness variable for path tracing are the weights shown in the glossy example. Solving the Monte Carlo problem of path tracing requires a probability distribution function (PDF) over these samples. The outer rays in the glossy examples are shown smaller, because they affect the outcome less than the rays from the perfect reflection. This optimization is as simple or as hard as you want to make it. The simpler you keep the sampling, the more approximate your solution is going to be. The best solution would be to sample your chosen BRDF. The cosine weighted sampling is shown to be perfect for diffuse only materials (diffuse materials have perfect lambertian reflectance). I found a sampling method for the Cook-Torrance BRDF in this paper: Microfacet Models for Refraction through Rough Surfaces. Direct lighting is easy to calculate. This is shown in almost all released 3D games out there. Simply calculating a dot product of the surface normal and light direction would result in perfect lambertian shading. 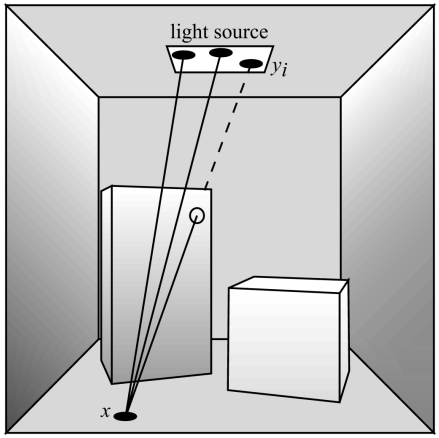 Whereas the indirect illumination should be sampled by the original method using hemispheres. With one exception, all of the rays hitting the light should be discarded (since the light gets sampled by the other PDF from above). These examples show only sampling of a single light, which is easy to maintain. Imagine a scene with thousands of lights and one sun. If you apply the same theory of the two PDFs from above, you would end up sampling more inefficient than the brute force sampling. The solution is rather simple, we add weights to each light. But these have to be based on different criteria: only adding weights based on distance could influence the effects of the sun (large distance, huge brightness) versus normal lights (small distance, small brightness). Other small optimizations could be added based on needs: you don't have to continually sample the sun during night time and so on. If you like to know the mathematics and details behind these two PDFs, I suggest you read the presentations from the references below. 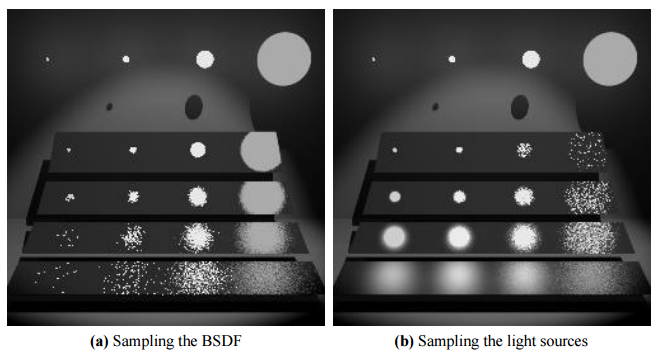 These are the two sampling methods shown from above, the BSDF sampling is the hemisphere indirect sampling and the light source sampling is the direct sampling using the area of the light. The problem is the glossy reflection on the four plates. You can see that indirect sampling works if the light is large enough to have some collisions with rays, and the direct light source sampling works fine for small area lights. This leads us to more recent techniques in path tracing, namely bidirectional path tracing. 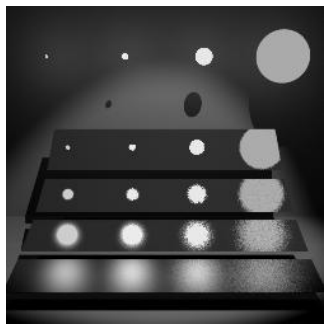 This technique is based on the inverse of path tracing, instead of finding the light by tracing rays from the camera, find the camera by tracing from the light. These are the shooting rays, and the original camera rays the gathering rays. The bidirectional part indicates that these two types of rays can be combined. This technique wasn't meant for real time path tracing applications which require responsiveness. Since for every gathering ray you shoot, the amount of calculation is doubled by also tracing shooting rays. This nearly doubles the time per frame, and thus decreases responsiveness. While you lose responsiveness, this algorithm increases the convergence rate for path tracing a lot, so in the end it's worth it. As extension to bidirectional path tracing, there is an algorithm called Metropolis light transport. This algorithm allows finding more difficult light paths by extending existing paths. 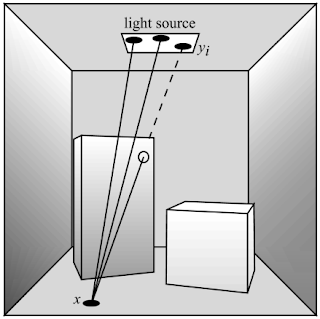 An example: A shooting and gathering ray have been found by the bidirectional raytracing method. Every bounce in these rays is recorded as a node. The metropolis light transport can add extra nodes on these rays to modify the existing ray to a new one. These nodes are placed in areas with high gradients. 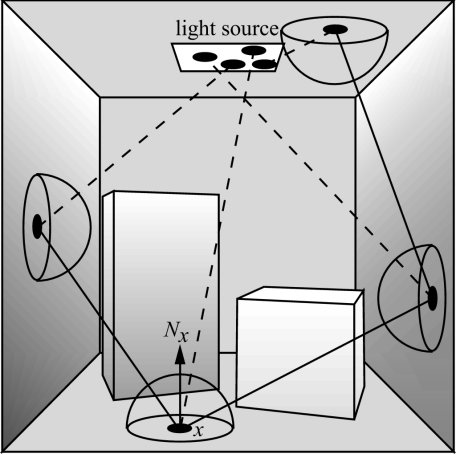 You can find more on this technique in this paper: Metropolis Light Transport. There is an opensource implementation of VCM called smallVCM. This implementation also contains multiple importance sampling and normal bidirectional path tracing. Showing the difference between Gradient domain path tracer (G-PT) and normal path tracer (PT). Image taken from . Path tracing 3D fractals. Also explains cosine weighted sampling, importance sampling, next event estimation, and image based lighting. Implementation in GLSL. Everything about ray tracing, and is currently working on a GPU path tracer. Community for path- and ray tracing. Walter, Bruce, et al. "Microfacet models for refraction through rough surfaces. "Proceedings of the 18th Eurographics conference on Rendering Techniques. Eurographics Association, 2007. Veach, Eric. 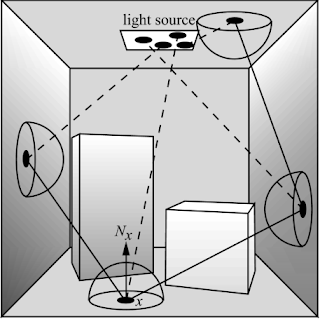 Robust monte carlo methods for light transport simulation. Diss. Stanford University, 1997. Veach, Eric, and Leonidas J. Guibas. "Metropolis light transport." Proceedings of the 24th annual conference on Computer graphics and interactive techniques. ACM Press/Addison-Wesley Publishing Co., 1997. Georgiev, Iliyan, et al. "Light transport simulation with vertex connection and merging." ACM Trans. Graph. 31.6 (2012): 192. Lehtinen, Jaakko, et al. "Gradient-domain metropolis light transport." ACM Transactions on Graphics (TOG) 32.4 (2013): 95. Manzi, Marco, et al. "Gradient-Domain Bidirectional Path Tracing." (2015). Kettunen, Markus, et al. "Gradient-domain path tracing." ACM Transactions on Graphics (TOG) 34.4 (2015): 123.